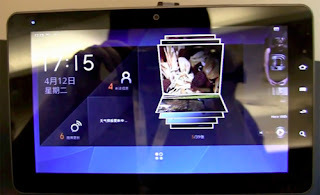 An unbranded tablet runs on OS MeeGo been featured on the show by Netbooknews IDF Beijing. Compared with Intel MeeGo tablet sightings that appear in the MWC in February 2011 and then, this new interface looks a bit simpler and cleaner, with a window floating and not display the fixed column along the vertical axis. Meego OS looks to be adjusted to some extent, shows a new icon, and Opera Mobile 11 is used as a standard browser.